Here's a post with a bunch of cards made with American Crafts Hazelwood collection from the folks at 1canoe2. All cards are A2 sized (4-1/4 x 5-1/2 inches) in size. A few of these cards incorporate fun gold-tone shaped paper clips. Flat clips on cards are easy to slip into envelopes, and can be protected from postal sorters with a corrugated (or other type of) insert in the envelope. Metal bookmarks from Prima Marketing feature an acrylic cabochon - excellent for highlighting a small piece of alcohol-inked Yupo. Yupo (I used white Yupo) is a non-porous surface that works well with Ranger's alcohol inks. These bookmarks make fantastic gifts and sell well at my local artisan market on Saturdays. Ranger Alcohol Inks used: Rust, Mushroom, Lettuce, Pesto, Turquoise and Denim. I used E-6000 and adhered the cabochon to the inked Yupo. Allow to dry to completely then trim around the cabochon. Adhere to metal bookmark using E-6000 and allow to dry 12-24 hours. My technique uses small spurts of heat, drying the inks intermittently using Ranger's Heat Tool, which I embellished with alcohol inks years ago. Products listed here were either seldom used or have never been used. 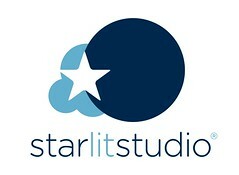 Please do not hesitate to email me (starlitstudio@gmail.com) with any questions. The process: Shop, then email a list to me (starlitstudio@gmail.com) with your zip code (or country, if international). Items ship from Flemington, New Jersey. Items will be weighed then exact shipping cost advised by return email. First come, first serve. Shipping within the USA and her territories: Use of Priority Mail Flat Rate and Regional Rate boxes will be utilized if there is a cost-savings for you, along with First Class Mail where possible. Parcels exceeding thirteen ounces in weight must be sent Priority Mail. Exact shipping including any discounts received from the USPS can be calculated after your list is received. Shipping for international customers outside the USA and her territories: First Class Package International is used up to four pounds; product exceeding four pounds must be sent Priority Mail International. Insurance is required and will be outlined as a separate line item in my email with postage cost. Parcel will be insured for full value (full value is merchandise value paid, insurance paid and postage paid). Payment: invoice will be sent via PayPal; payment appreciated within 24 hours. I am absorbing the cost of the mailer if using First Class Mail, along with the PayPal fees incurred and fees associated with printing the postage and all other incidentals. The Memory Box / Poppystamps sets in this section are housed in Avery Elle clear pockets with white 100lb cardstock liners. Stamp sets are organized using the product packaging of the stamp set, and labeled with 'mb/poppystamps' in the upper left of the pocket in black on a clear label, and on the right is the stamp set name in black on a white background using a label maker. Dies are neatly arranged on a magnetic sheet stabilized on a chipboard base and located behind the white cardstock liner (stamp set is in the front). Any questions please email me. Poppystamps Cat Friends CL433 stamp set and coordinating die set: Cat Friends 1626 - both new in packaging. $5 for both. MFT stamp sets with coordinating die sets: stamp sets are neatly mounted onto heavy chipboard trimmed to size of the stamp packaging. Die set is housed in a cardstock envelope mounted to the back of the chipboard and features a magnetic closure. My own design - clever, keeps everything together - clever storage that is functional and visually appealing. I maintain the plastic CD cases and they are in top-notch condition. Unless the stamp set states 'new', the set has minor staining on one, some or all pieces - this does not affect usability; simply makes them easier to view in the CD case. If 'new' is stated - stamps have never been used and are brand new and unstained. All sets are in clear CD cases with PTI set label on spine. If it's an older set before Nichole began including the name of the set with the index labels, the CD spine is neatly labeled with a label maker. All stamp sets (except where noted) have the image index label(s) that came with the set with the protective layer intact....index labels were not adhered to the CD; instead, I kept the protective layer of the index label intact, save for the slim label that is on the CD spine. The protective layer of the identification label was adhered to a sheet of cardstock, and I neatly (yes, alphabetized - my OCD runs rampant!) organized the labels in a binder behind clear sheet protectors (so I could flip through the binder and get ideas). As a result, the protective layer of each identification label sticker is still intact - and I have concealed the small strip of adhesive residue remaining from when I removed it from the cardstock sheet/my binder, by affixing a post-it note to the back of the protective layer. This way, if you want to adhere it to the CD you can, or keep it in a binder like I did, or another storage/organizational method that works for you. The Papertrey sets in this section are housed in Avery Elle clear pockets with white 100lb cardstock liners. Stamp sets are organized using the Papertrey index label on a clear acetate sheet(s). Sets are labeled with 'pti' in the upper left of the pocket in black on a clear label, and on the right is the stamp set name in black on a white background using a Brother label maker. Most of the stamps within these sets are used. Any questions please email me. Papertrey Ink Fruit Fusion - Mini Apple and Mini Pear Clear Stamp Sets (photos above) - includes apple and pear dies too - $8 for everything.